Fabiano Caruana had the “easier” job on paper. He was half point ahead of the field and was playing the lowest seed and the player standing at the bottom of the standings list. 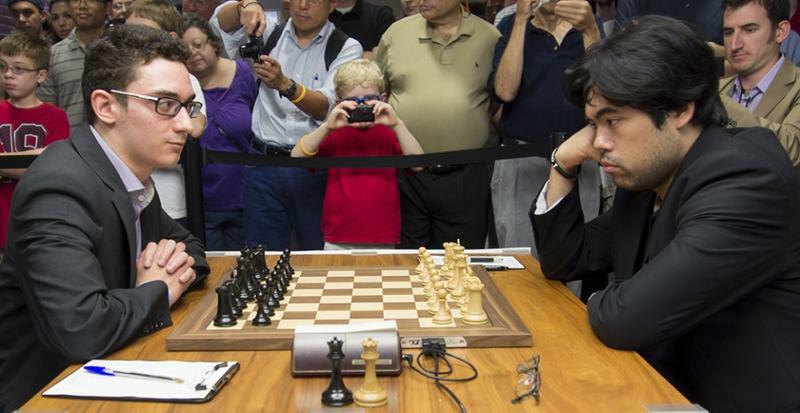 In the rearview mirror it was Hikaru Nakamura and Wesley So who had to give their all to catch Caruana at the top and force the playoffs. Caruana knew how big of a favorite he was in his match against Akshat Chandra, who is 16, and he was ready to pull the trigger and run home with his first U.S. Championship title. The games started slow. For the three favorites: Caruana played his favorite opening as Black, So played an unusual line and Nakamura, being the only one with almost no chance at winning his game, entered a dull line. It wasn’t long until Nakamura threw in the towel and drew his game against Ray Robson. He was now 99 percent out of the title contention; and he agreed that this final game was not the reason for his title slip up. He blamed his inability to beat Chandra and his Hara-kiri game against Caruana. So, on the other hand, was pressing. He knew the opening better and obtained a marginally better endgame. Black was a pawn up in that game but had to face the constant pressure of the bishop pair, as well as the ongoing ideas of giving one of the bishops for the knight and entering a bishop of opposite color endgame. One thing that So is known for in the chess world is his Carlsenesque ability to grind down his opponents, especially the lower rated ones, in positions with minimal advantage. With accurate technique, he managed to get his opponent to the breaking point and could have gotten an almost decisive advantage if he would have spotted the tricky winning move! Locking the opponent’s bishop and allowing his passed pawn to have a clearer path to promotion. Instead, he allowed the bishop to find freedom. From there on GM Alex Lenderman’s resilient nature did not crack and the two split the point at move 72. Caruana was closely studying his rivals’ games throughout the round, and was surely quite relieved when Nakamura drew and So spoiled his chance. A draw and he would be crowned as the new U.S. Champion! But he is Caruana, the #2 player in the world and one of the most ambitious young players this planet has to offer. He wanted to win his first American title in style, and he pressed! With every move the pressure was increasing on young Chandra, and at move 29 he mistakenly offered the Bishop exchange with 29.Bc4?! This allowed Caruana to grab the initiative and from there on it was all downhill for the young Chandra. 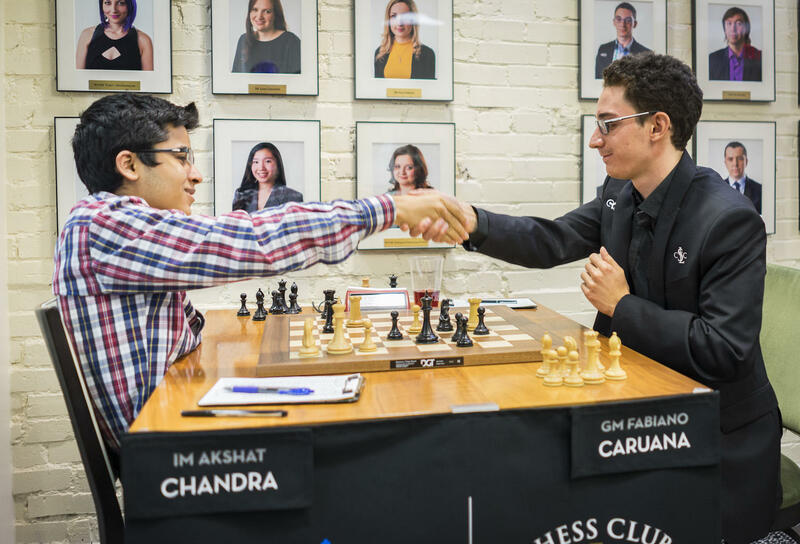 Caruana improved his pieces with every move and annihilated every counterplay that his opponent could use towards his escape. At move 53, the new American champion was crowned! Cristian Chirila is a Grandmaster, head coach of Bay Area Chess Elite team, and former World Youth Champion Under 16. On Chess is provided by the Chess Club and Scholastic Center of St. Louis. 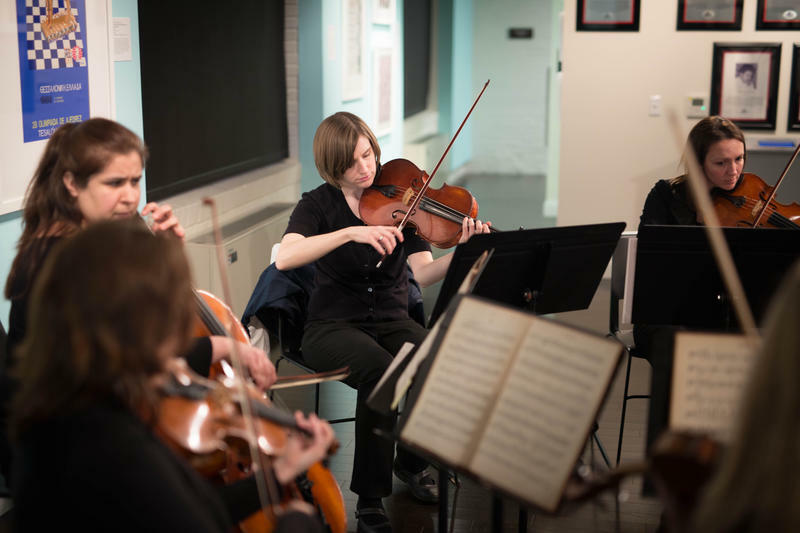 Chess and music are topics that intertwine frequently at the World Chess Hall of Fame. Through exhibits such as Living Like Kings, visitors learned about how the birth of hip-hop coincided with a surge of interest in chess among Americans. In Cage & Kaino: Pieces and Performances, revolutionary 20th-century composer John Cage and contemporary conceptual artist Glenn Kaino produced works that highlight the sense of community created by chess, especially when interwoven with music and art.